Here is your Friday Whatsit for May 28th. Another image shot by yours truly, this time on the Leica TCS SP2 laser scanning confocal microscope. The objects in this image appear at 630X normal size. Your clue for this one is yesterday’s post on the blood cell bakery. 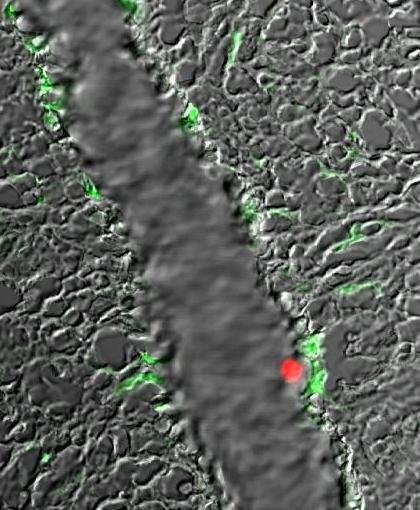 The red dot is a special kind of cell found in the bloodstream. Which of the many kinds of blood cells? To figure that out, you need to know that it was selected with two surface markers called TCR and CD8, then dyed red and put back into its natural habitat (the blurrier bit of the gray background, a cross-section of a tube). The green bits in the image don’t much matter for this challenge, but I will tell you they are green because they are marked with green fluorescent protein, which we talked about in the answer to the May 11th Friday Whatsit. The experiment involved asking whether the little red dyed cell could make it to this particular area from a random injection site. So, what is the little red-dyed cell, and what is the tubey-thing that it is rolling through? Submit your guesses in the comments section, answer on Monday. Don’t be afraid to be wrong, it happens to me all the time! This is just a guess based on the cookie videos, but is it a T cytotoxic cell? Learning through baked goods is a cool thing! Go Murph! Clearly I am making these Whatsits too easy. Either that or I am providing a quality educational experience 😉 I agree baked goods make learning fun. « Bicycles, Tomatoes and Condoms — Oh my!